The four people who envisioned the Knauer Center six years ago are (from L to R) Richard K. May, Linda Foster, Connie McEvoy and Tom McEvoy. Photo by Christie Green Photography. WEST CHESTER — After six years of hard work, Uptown! Entertainment Alliance is ready to debut its theater, the Knauer Performing Arts Center, to the public. The New Year’s Eve Gala, sold out since October, was one of the best places to be as the clock struck midnight on the 31st and what a night it was! Guests were treated to to variety of entertainment from a selection of our Resident Companies including: a Latin violinist Belmaris Lorca, Better Than Bacon Improv, the Sara Michael Quartet, and Windish Music and Production’s dance band, New Street Heat. Guests were invited to explore all three levels of the theater and enjoy food provided by John Serock Catering. As the night went on they participated in a live auction and danced until confetti rained down on them at midnight. 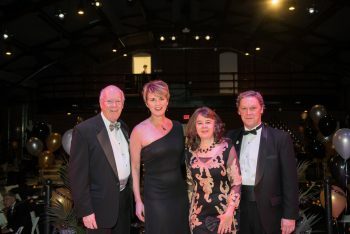 The fundraising event raised more than $125,000 to benefit the start of operations at the new theater. Uptown! is now looking ahead and packing 2017 full of amazing entertainment, starting with events from its eight Resident Companies. January warms things up with the Julian Brenman Youth Acting Workshop from Yajaira Paredes Productions, Jazz Cocktail Hour featuring Vocalist Rhenda Fearrington, and Better Than Bacon Improv. Tickets for the Resident Theatre Company’s production of Monty Python’s Spamalot in April 2017 are also moving quickly. Uptown!’s successful membership program, launched in the fall of 2016, goes into full swing as events begin on the theater’s three stages. For more information on Uptown! Entertainment Alliance’s ticketed events, Resident companies, membership program, or rentals, see the Uptown! website at www.uptownwestchester.org. From Benjamin Franklin and the National Guard, the Armory Building has made its mark on history and will continue to do so as the Knauer Performing Arts Center. Tags:Knauer Performing Arts Center · Uptown!